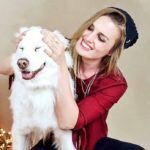 How to Brush a Dog’s Teeth? 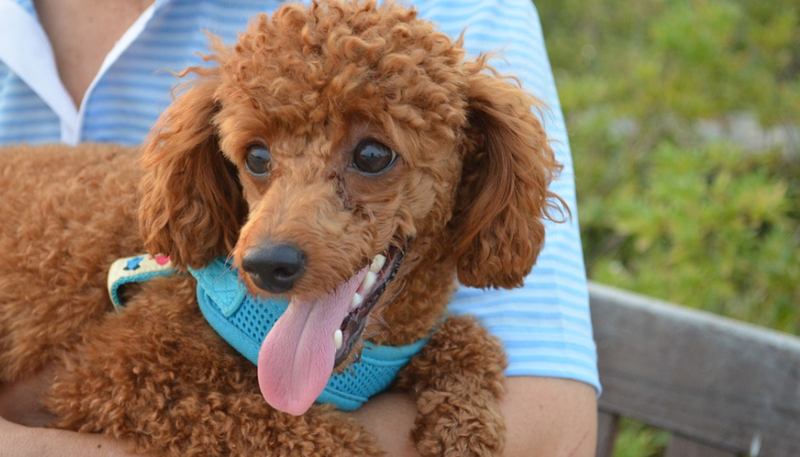 How to Remove Tartar from Dogs Teeth? What Dog Toothpaste for Puppies? Many dog owners often assume that dogs don’t need their teeth brushed. Although dogs genetically don’t have as many dental issues as we do, they can still get painful cavities and sometimes they even have to get their teeth removed. Not to mention that rancid breath that we all know too well! Choosing a regular toothbrush might seem like a good idea, but dog’s teeth get much thicker coats of tartar built up. Our toothbrushes are either far too soft or far too stiff. Either way, a normal toothbrush just won’t do the job that a dog one will. 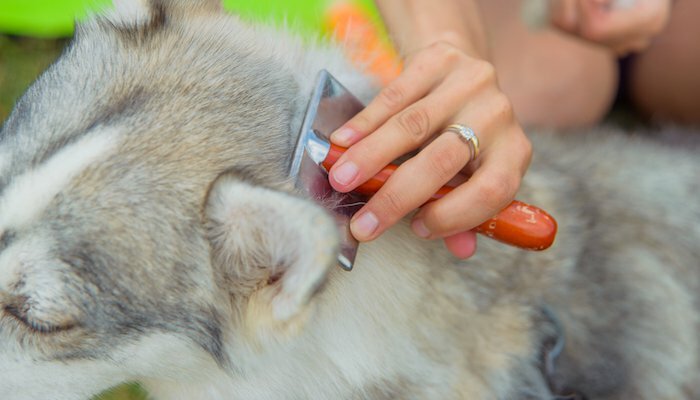 We’ve searched every corner of the web to find out exactly what toothbrushes are the safest and most effective for your dog. Instead of scouring the aisles at your local pet store, check out our top 10 best dog toothbrushes and choose the perfect toothbrush for your furry friend! We think you’ll love… Best Dental Chews for Dogs. The H&H toothbrush is a very unique version for one reason: It’s a finger toothbrush! You put this thing on like a finger glove, and it gives you full mobility and easy access to all of your dog’s teeth. It’s very comfortable for your dog since you’re not shoving some strange object (a normal toothbrush) into their mouth. Unlike many cheaper versions of dog toothbrushes, these ones are very soft to the touch. They don’t cause any harm, nor do they wear away at your dog’s gums. While brushing your dog’s teeth, keep in mind that their gums are still sensitive like ours. This means that you have to be soft and steady, which is very doable with these finger brushes. 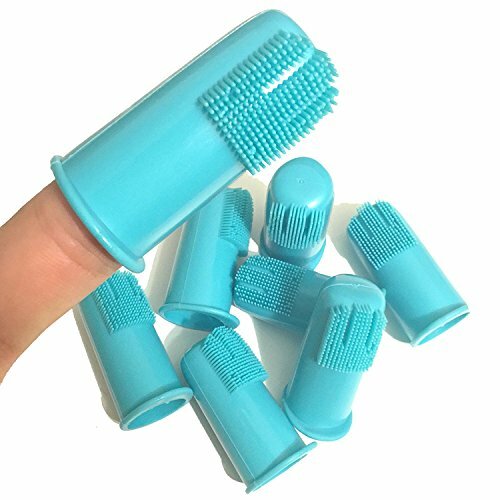 These finger brushes are not only more comfortable for your dog, but they easier to use for you too. Instead of figuring out the right angles to get with a toothbrush, or worrying about gagging your dog, you’ll know exactly where you’re brushing. Your dog will be thankful as well! 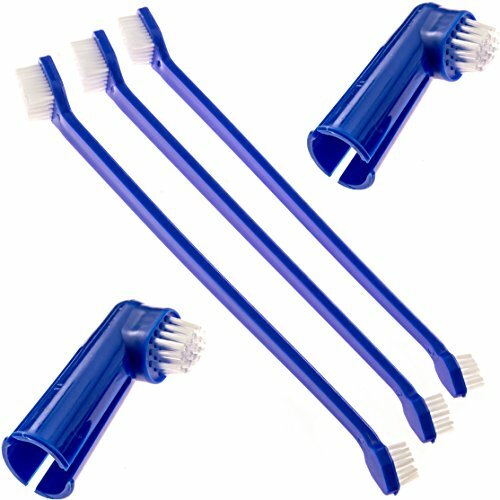 Why We Liked It – This unique spin on dog toothbrushes provides a cheap, easy-to-use solution to the task. It’s soft enough to prevent harm but firm enough to get the job done right. Choosing the right toothbrush might be difficult, but Duke’s Pet Products Dog Toothbrush makes it a little easier. There are 2 sides to this dog toothbrush, one that has long bristles and the other side has shorter bristles. This gives you 100% control to focus on what makes your pup more comfortable. This mega-long toothbrush is 8.5 inches long, which is perfect for dogs with longer snouts. It can be both annoying and painful for you and your dog to reach way back to their back teeth with a shorter toothbrush. Luckily, this longer model cancels out those problems and makes the experience much more enjoyable for both of you. Instead of choosing between a dog toothbrush that has longer bristles vs shorter bristles, this brush gives you both options. Generally speaking, the shorter brush works for the front teeth, whereas the longer brush works better for the back teeth. It’s a great solution that gives you the best of both worlds. 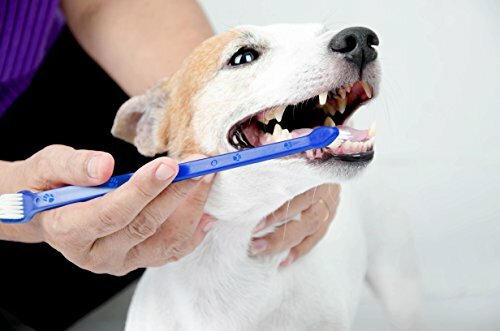 Why We Liked It – Instead of choosing a short toothbrush that makes it very hard to brush your dog’s back teeth, this 8.5-inch toothbrush makes it 100 times easier! Sometimes brushing your dog’s teeth can be a chore, but luckily this toothbrush makes it a little bit easier. It’s almost weird that there aren’t really any ones like this for humans, but the Kissable 3-Sided Toothbrush for Dogs targets all sides of each tooth. This effectively brushes the dog’s teeth incredibly fast so they can get back to playing quickly! Obviously, the biggest part about this toothbrush is the 3 sides. So how does it work? Well, it fits over your dog’s tooth like a crown (of bristles) and with a gentle motion, you brush away the built up. It’s very simple, yet incredibly effective. Dogs have very soft gums, and Kissable recognized that when they made this 3-sided toothbrush. The outer bristles are very soft to massage your dog’s gums, while the inner bristles are more firm to clean their teeth. Why We Liked It – It’s hard not to like such an efficient product! The fact that they even made soft outer bristles with your dog’s gums in mind makes it all the better. If you’re looking for an all-in-one kit, we’ve found the right one for you. This all-inclusive dog toothbrush kit comes with a toothbrush, finger toothbrush, and dog toothpaste. Instead of buying them all individually, this set makes it easy and very affordable to get them all as a kit! 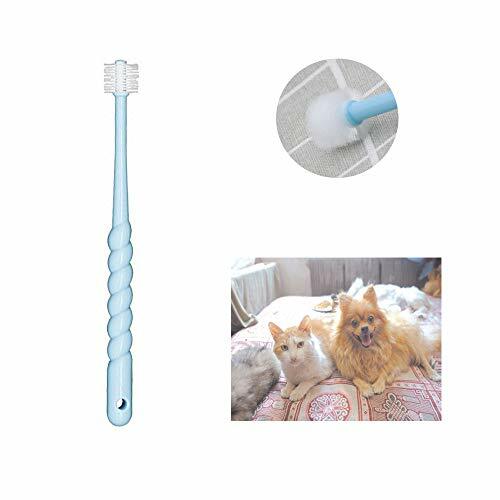 This double-sided toothbrush for dogs has a short bristle side and another with long bristles. You can now easily get both the front and the back of your dog’s mouth with this toothbrush. It’s also angled, which allows you to reach far back without gagging or hurting your dog. Using the perfect combination of ingredients, the toothbrush included in this kit is perfectly fit for dogs. You can’t use just any old toothpaste since dog’s don’t react the same as we do to certain textures, flavors, and chemicals. The finger toothbrush is also a nice addition to the kit. It allows you to softly massage your dog’s gums without causing them discomfort. Why We Liked It – This kit includes everything you need to maintain your dog’s oral hygiene. Instead of choosing one or the other, you get both a finger brush and a toothbrush. This little kit gives you some finger toothbrushes and a regular toothbrush as well. Instead of choosing one over the other, you get both! Finger brushes are excellent for gums and light brushing, and toothbrushes are good for removing hard tartar formed from plaque buildup. Using finger toothbrushes is an excellent way to prevent plaque from turning into tartar. Plaque is easily removable, but without daily brushing, it can turn into tartar. Tartar is hard, and sometimes requires professional removal in severe cases. This toothbrush gives you the option to use either long bristles or short bristles. It’s also very long, which helps with getting the back of the mouth as well as the front. Dogs with longer snouts require much longer brushes than those with shorter snouts. Why We Liked It – Instead of choosing one or the other, this kit allows you to have both options for your dog’s oral hygiene. Make sure you remove plaque early before it turns to tartar, which will be easy with everything included in this kit. Most finger toothbrushes for dogs are soft-bristled or have small bumps. These usually work wonders for massaging gums, but not so much for teeth. However, the Pet Republique finger toothbrush uses firm, compact bristles to brush almost as good as a normal toothbrush. Usually using finger toothbrushes only works for plaque and easy-to-remove build-up, but the bristles on these brushes make it just about as good as a real toothbrush. Dogs are often more comfortable with finger toothbrushes since they aren’t long and awkward to use. 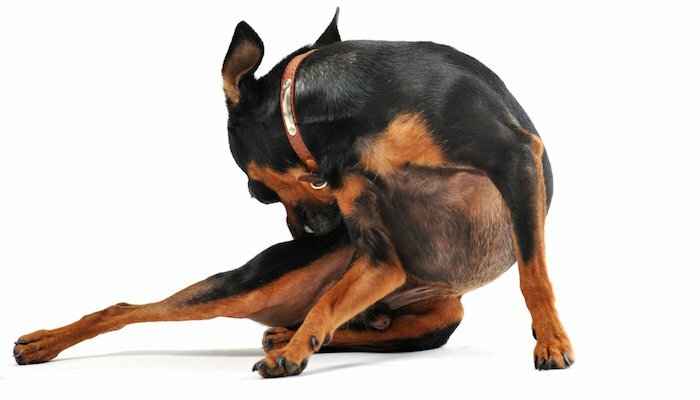 When you’re brushing your dog’s teeth, it’s important that you’re comfortable as well as the dog. It shouldn’t be a stressful procedure that you both dread. These finger toothbrushes allow you to choose from the size to the bristle type and even the pattern of the bristles. Why We Liked It – While most of the finger toothbrush competition uses softer bristles, this one is perfectly firm for both gums and teeth. This dog toothbrush kit is perfect for anyone who’s on the fence about choosing between a toothbrush and a finger toothbrush. Both have their strengths and weaknesses, but you don’t have to pick one or the other. With this kit, you get both! The finger toothbrushes included in this kit are unique in several ways. 1) They’re made of hard plastic instead of a flexible rubber, which makes it easy for you to choose exactly where you brush. 2) They use nylon bristles instead of rubber bristles. The nylon bristles are a great addition because it mimics a normal toothbrush while giving you the mobility of a finger toothbrush. 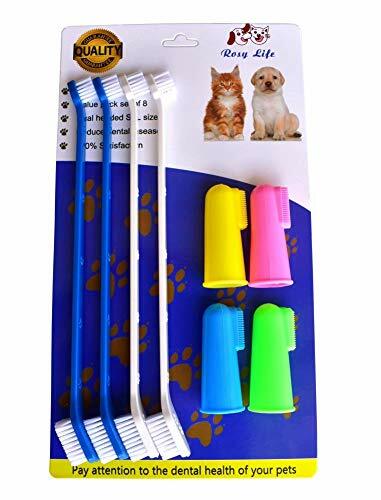 The long 8.5-inch reach of these toothbrushes make is super easy to get all the areas in the far back area of your dog’s mouth. It can be tough trying to reach way back there but using this long brush, you’ll have no problem! Why We Liked It – The finger toothbrush takes the nylon bristles from a normal brush with the mobility of a finger toothbrush to make the ultimate combination. It’s perfect for all dogs and owners! This toothbrush is exactly what you need if you have a small dog! Small dogs are much more difficult when it comes to finding the right toothbrush for several reasons. They have smaller mouths, which means they can’t use the super long models, but they also can’t have something too small that they could choke on. This multi-angled toothbrush is perfect for you, the owner. It sits comfortably between your thumb and index finger to give you maximum control. You don’t want to drop the toothbrush while using it, because it could get lodged in your dog’s throat. Having a perfect grip is the #1 thing to look for when buying a dog’s toothbrush. 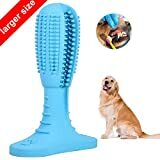 The smaller head on this toothbrush is great for smaller breeds of dogs. 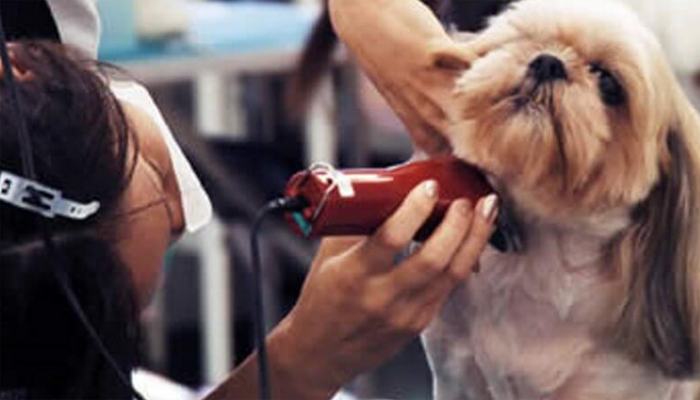 Chihuahuas, French Bulldogs, and Toy Poodles often require special attention for their oral hygiene. Luckily, these bristles are sized exactly for their small mouths and teeth. Why We Liked It – Shopping for smaller dogs can be a difficult experience in general, so when we came across these toothbrushes specifically designed for them we had to share them! 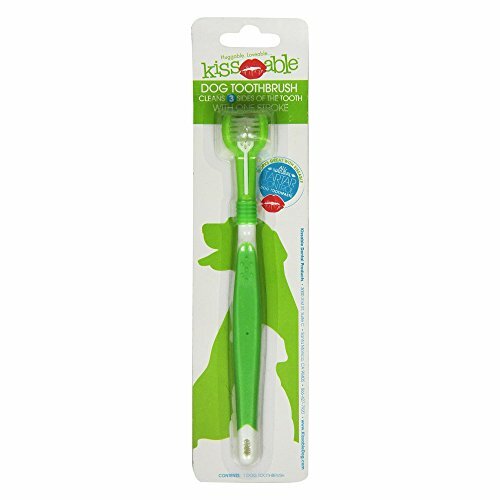 Kissable made a 3-sided toothbrush for dogs that everyone’s going crazy about. When they made a kit that included this masterpiece, we had to jump right on it! 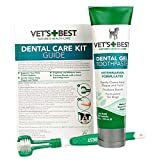 This kit includes the 3-sided toothbrush, a finger toothbrush, and some toothpaste for dogs. The 3-sided toothbrush is obviously a wonderful invention. 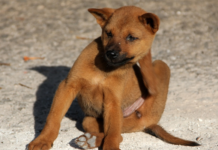 It brushes all sides of your dog’s teeth, while gently massaging his or her gums. 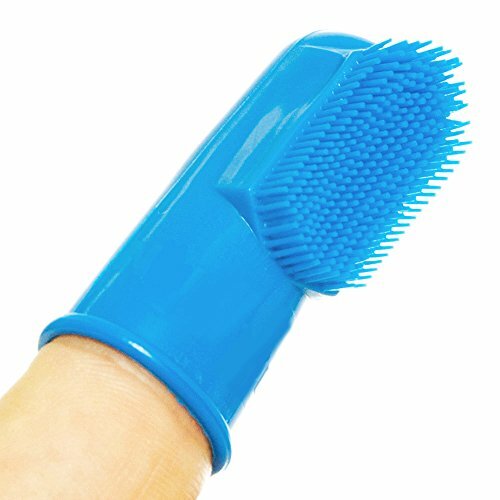 The finger toothbrush is also perfect for dogs with extra-sensitive gums that need a little extra attention. Natural ingredients like vanilla and tea tree oil ensure your dog has excellent oral hygiene, and they help a ton for their breath too! There’s also kaolin, which helps polish your dog’s teeth to keep them shiny and squeaky clean. Another ergonomic option is the 360-Degree Pet Toothbrush by VTurboWay. The swirled handle fits perfectly in the palm of your hand, which makes brushing your dog’s teeth much easier. It also features a 360-degree brush at the end to make it simple and to the point. Brushing your dog’s teeth has never been easier. Without worrying about what side the brush is on, you can get right to work on cleaning their chompers. You can also brush their teeth by simply swirling the brush, which makes it so much easier. Oftentimes it can be a struggle to get the right grip on a dog toothbrush. They’re often too small, or just too straight. This swirled design makes it easy to grip. It’s also just short enough for a small dog’s mouth, but not too small to handle. Why We Liked It – We wanted to find a small toothbrush that was perfect for those tiny breeds of dogs. When we came across this one, we knew it was exactly what you’d need! Now it’s time to select the right toothbrush for your dog. But how do you know the correct method of brushing? Or which toothpaste is right for your dog? All these questions can make this process way more complicated than it should be. We’ve decided to ease a headache and solve some of the biggest questions that come with choosing the best toothbrush for your dog! Brushing a dog’s teeth is similar to brushing your own teeth. Brush in circular motions, while covering the entire surface of each tooth. Don’t forget the gums either! Dogs are very prone to gum disease, so massage those gums and prevent future illnesses. Brush your dog’s teeth every night for optimal results. Just as with our teeth, food and other particles that settle on the teeth will form plaque and eventually tartar. You can prevent both of these by brushing your dog’s teeth after his or her last meal. To remove tartar from your dog’s teeth, you should use special dog toothpaste and a toothbrush with firm bristles. Tartar is very strong and will take some elbow grease to remove. In some cases, professional removal is necessary. 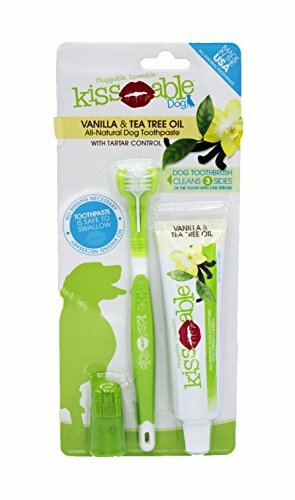 The Kissable Dog Dental Kit at #9 contains an amazingly effective toothpaste for dogs of all ages. It’s the best toothpaste for puppies especially because it’s all-natural. Vanilla and tea tree oil make this puppy toothpaste very effective and long-lasting. Selecting just any toothbrush won’t work, dogs need special attention when it comes to their oral hygiene. A normal toothbrush (a ‘human’ toothbrush) is oftentimes too short, too long, too firm, or too soft. So what’s next? You have to choose either a dog toothbrush or a finger toothbrush for dogs. It’s a personal preference for the most part, but there are a few differences. In the end, we did everything we could to make this choice as easy as possible. We really how much you love your dog, and how important it is to you that they are clean and healthy. Hopefully, our advice has given you a better understanding of how to choose the best toothbrush for your dog! Dogs with longer snouts, such as German shepherds and black labs, require longer toothbrushes. Finger toothbrushes work very well for dogs with small snouts, like Chihuahuas and Yorkshire Terriers. Up to 80% of dogs who are over 5 years old have some kind of oral disease. Brush those teeth to keep them in the 20%!